“Titanium Mike” was inspired by the true story behind Paul Bunyan, a now-beloved mythic figure who was, in fact, popularized by a logging company’s advertising campaign. And yet, although inauthentic, he does indeed strike a chord in most Americans. I wanted to play with the tug-of-war between reality and unreality and examine the power of story. That this play takes place in a fictional story is part of the fun. I knew very early on that the story would be told as a series of vignettes going backward in time, each connecting with the next, with the stories of Titanium Mike becoming less and less outlandish until we meet his real origin as an advertising character. I began the writing process by spinning a bunch of Titanium Mike stories, then built the rest of the story around them. As submitted to F&SF, this story had just four scenes and ended with the advertising copywriter’s invention of the character Titanium Mike out of whole cloth. Gordon Van Gelder sent me a contract but asked me to write one more scene, showing the real-life Titanium Mike. I wasn’t completely convinced, but I wrote it as requested. We went back and forth about whether or not to include that scene but I finally agreed to leave it in. It was the right choice. The story went on to be nominated for the Nebula and picked up for numerous translations. Sophie didn’t reply, just shook her head slowly inside her helmet. Sophie looked mighty dubious at that. But dubious didn’t use nearly as much oxy as panicked. At that, Sophie actually managed a weak little smile. Helen smiled back at her. As she warmed to her subject, she found her own mood changing — the stories took her back to the early days of the Aurora Mining Company, when a certain amount of privation and danger was just a part of the job. “Mike was born on Earth, but he never fit in there. He was a big man and always kept hitting his head on things, or tripping over his own big feet. One day he said to himself ‘Why can’t I just float around and avoid all this bother?’ So he decided to go to space, where he could do just that. “But he realized he’d need something to breathe when he got there, so he took an old pickle jar, stuck some seaweed on the bottom, and screwed it onto the neck of his suit, and that was the beginning of hydroponics. Then he found some old thrusters that were lying around, but he was too big for just one thruster to lift so he stacked up a few of them on top of each other, and that was the beginning of the multi-stage lifter. “When he got to space all the people were just drifting around with nothing to do. So he took some old foil food wrappers and spun them together into a big shiny dish to concentrate the sunlight, and then he went down to Luna and started throwing rocks into the hot spot, and that was the beginning of solar smelting. 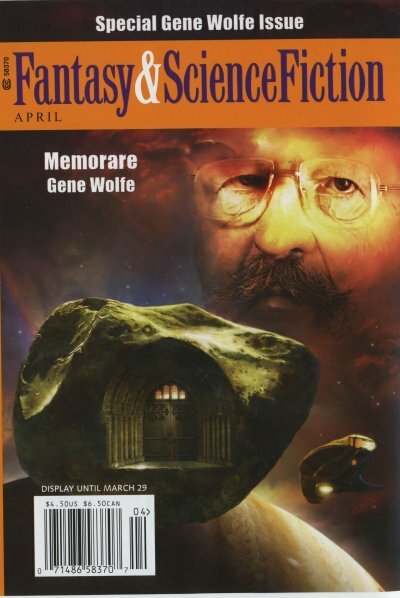 Honorable Mention in Gardner Dozois’s Year’s Best Science Fiction. © 2019 David D. Levine. All Rights Reserved.